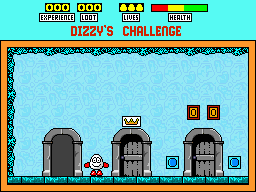 Dizzy accepts a challenge to defeat a wizard in his domain. 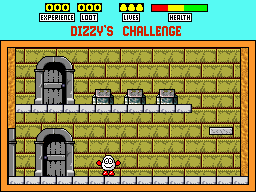 Dizzy can carry up to six items. This game is suitable for all ages. This game can be ruthless and it is easy to lose items that are necessary for progress, or get stuck by using items incorrectly or even using them in the wrong order. So I'd recommend that you save often! There are no 'subtle' secret areas such as invisible bits of wall etc, but secret areas can be revealed by spells. Other than that you'll have to work everything out for yourselves. Loot points are awarded for treasure collected and experience points for killing monsters and good gameplay. Plus bonus points are awarded at the end of each level for if you impress the wizard with your gameplay. The Maximum score for experience and loot is 900 each, but that is very difficult to achieve, and by that I don't mean hordes of monsters, just clever game play.